Step 1 Cook the beets in a medium saucepan with enough water to cover them by 1 inch. Simmer the beets until they are tender, about 45 minutes. Remove from heat, drain the beets and set them aside until cool enough to handle. Step 2 Peel and grate the beets, saving any liquid produced when grating. You should have at least 1 cup of beets (any extra can be used as a garnish for salads and will keep, refrigerated, for up to 1 week). Step 3In a large bowl, combine 1 cup grated beets and reserved liquid, buttermilk, sour cream, sugar, lemon juice and salt using a large spatula. Step 4One hour before serving, gently stir in the green onions, cucumber, dill and parsley. Cover and refrigerate to allow the flavors to marry. This makes a scant 5 cups of soup. Step 5Serve each bowl with a sprinkling of dill and slices of hardboiled egg. In Recipes-list.com we have selected the most viewed recipes from category - Best recipes Main courses Soups Vegetarian . Enjoy the best recipes specially selected for you! 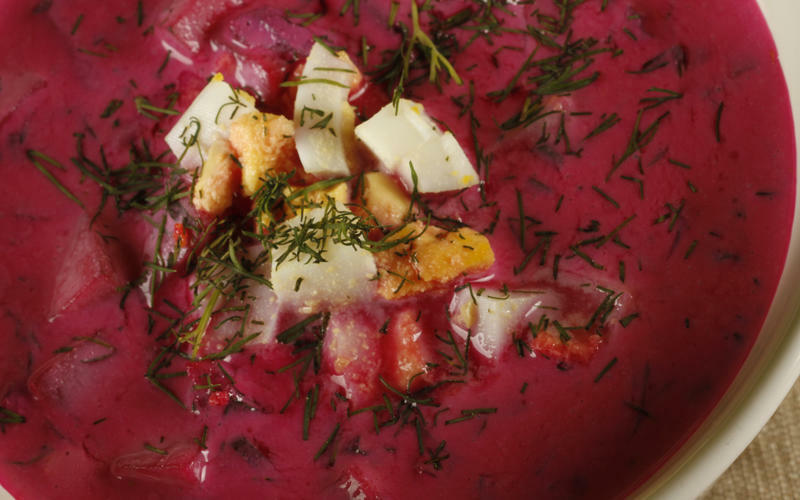 Warszawa's cold borscht is the right choice that will satisfy all your claims.